How do I add client area sub contact? 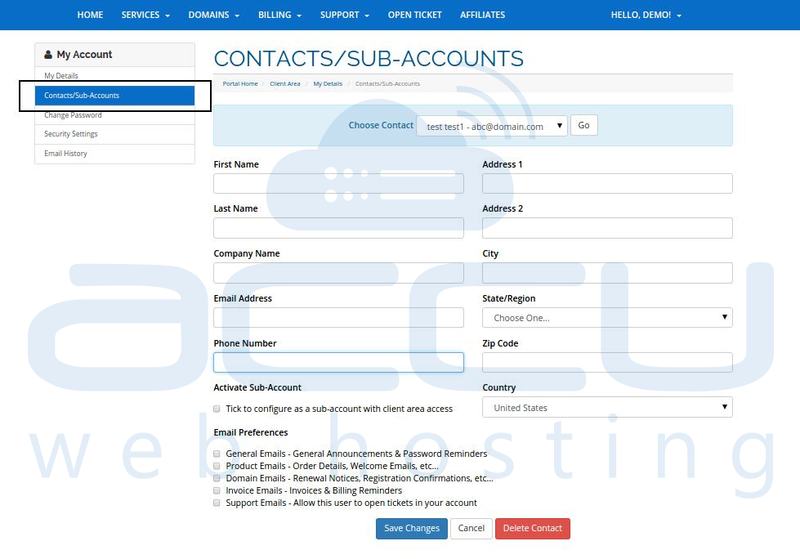 You can add multiple administrative email accounts in client area to manage your hosting account with AccuWebHosting. The secondary admin account is more helpful when you want to setup different email address for your employees or departments using the same hosting account. Login to your client area. Click on your usename and select Contacts/Sub-Accounts option from the drop down. In the next screen fill all the necessary details and assign required privileges to secondary account. Check Activate Sub-Account option to provide client area access to this sub-account. After enabling this option, more options will be loaded on the same page. You can provide password and manage other additional privileges from there. You can also set Email Preferences as which type of emails should be sent on this email address. After filling up the required details of sub-account, click on the Save Changes button. How to enable/disable registrar lock from client area? How do I check my services and hosting packages from client area? How do I login to client area? How do I update billing and contact information from client area?